Been searching for over an hour, unable to find anything even close! 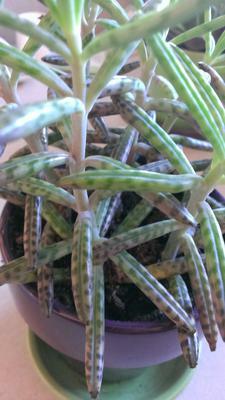 It's a young plant, it has several stalks which are a green, fading to purple. The bottom leaves are green, fading to purple all with dots on them. The top leaves are a bright green with no purple, but with spots. The tips of each leave has a few tiny (I'm talking TINY) spikes. 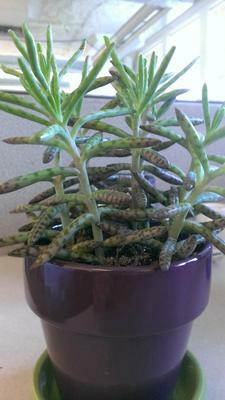 I got it from Home Depot during a Succulent sale, and after potting it and keeping it in a nicely lit office window (also, a 24 hour business, so the lights are always on, it appears to be thriving in the two weeks I've had it, but I have yet to identify. I'll attach a few pictures. Comments for Been searching for over an hour, unable to find anything even close! Also known as the Mexican Sombrero hat, and various other names. 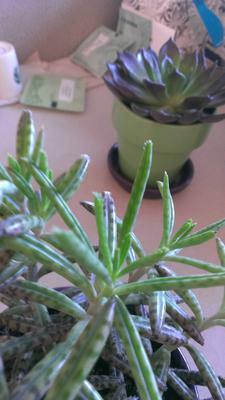 It's related to the Mother Of Thousands, and it's in the Kalanchoe genus. These are an easy plant to take cuttings from, and they have a 100% success rate. Have a look at the page on succulent plant propagation for more about it. I was just reading about how it doesn't "seed" but sparks new baby plants! I love it! But I can tell I'm soon going to need a bigger pot! Yes, Bailey, you are going to need a bigger pot. In fact, you will need many more pots because your plant can proliferate amazingly. That little baby will be almost unrecognizable when mature which only takes about a year. It will be crowned with a most beautiful crown of yellow and pink bell shaped flowers, which last only about a week. Then say goodbye to your plant. Having flowered it has achieved its end and will wilt and flop down. Nature, however, has longer plans for K.D. Did you know what Kalanchoe means? Neither did I, so I Googled it and to my delight found that it is a transliteration of the Chinese name meaning 'that which falls to earth' which is a very good description of the way in which several members of the genus propagate their kind. These plants are beautifully adapted for survival in severe, semi-desert conditions. Imagine these plants in their natural environments and consider how evolution works. I can only speculate upon my own observation of their growth habit in the greenhouse. Soon your little plants will get taller, as they do they will flop over and then begin to shoot upward again, so that they resemble small "J" shapes and hang outside of their tiny pot. This is their way of exploring new territory. If, however, they are planted in wider pot (deep is not necessary as they are very shallow rooted) they will literally 'put down roots'. Again imagine the plant "in situ" in its natural environment. You may notice small whiskers growing out of the bottom of the 'j', which will turn into roots. If and when they encounter moist soil. Then they are "off to the races". As it grows it develops these long tubular "branches" at the ends of which develop tiny plantlets or clones on the tips. These clones will assure the survival of the species, even if the mother plants withers and dies. Being poisonous is another survival technique that is quite efficient because they prevent pests and animals from making a meal of them. Over time, the non-poisonous plants may not reproduce due to being eaten, while the icky ones proliferate. Say a wild goat happens upon a k.d. Plant and takes a nibble on one of the branches! In very short order he is in the throws of mortal agony. His fellow goats will therefore deduce that those "succulent" looking plants(pardon the pun), are better left alone. Meanwhile some of the branches may have been knocked of in the fray, and once they have "fallen to the ground", hence the name, those tiny plants will themselves soon set root, and when mother leaves this mortal world, all of those many branches will become new plants. In theory, the flowers may have been pollinated, and born copious amounts of viable seed, but they may not have either. I have never bothered to keep them that long after flowering. I do however plant them in large pots along with their cousins, the mexican hat plants, or mother of thousands and with the swordlike snake plants I believe our friend who called them that may be confusing them with another kalanchoe which sets copious plantlets all around the perimeter of each leaf. Btw, K. delagoensis will reach a height of around three feet tall at maturity, so it can provide vertical interest to a mixed planter. By the time it flowers and dies if you look down below, you may find several new plants that look just like your plants, bailey, and so the cycle of life to death to new life goes on and on. By the way, I'm new to this site, and only found out the real name of my plants today, while trying to identify it correctly. Til now we called them "christmas trees". I'm learning more about this fascinating genus all the time because our little garden club has plant sales all the time and i am trying to have more plants and more selection all the time. By the way from now on I will call them by their more common,"common name" of "chandelier plant". p.s. if I learn how, I will post a close up of the flowers. up in Canada, they are just flowering now - stunning! Maurice, if you contact me via the form (link is in the footer of every page on this site) you'll be able to send me pictures - can't wait to see them!